Divorce is a topic not often discussed by retirement account administrators or investors. According to the Population Association of America, currently, 22 percent of women and 21 percent of men have ever been divorced in 2016. If current divorce trends continue along the same tracks, it’s something that needs to be spoken about. What happens to an IRA or Individual 401(k) during a divorce? The answer varies by the type of retirement plan and effects of additional variables, such as state law. But in most cases, it is split up along with other assets and property, through the negotiations by both parties and defined in a document called a Domestic Relations Order (DRO). Marriage (and divorce) is regulated by individual states. Meanwhile, retirement plans fall under federal law. And according to federal law, only marriages that are legal under the law of the state in which the marriage took place may be recognized when filing a claim to an individual’s retirement plan assets. The first step in determining which portions of retirement plan assets go to the two parties is to decide whether the non-account owning spouse wants a share of the retirement account, or trade his or her share in that account for assets of equal value. This is called the present-day valuation buyout. The other assets can be cash, stocks or property, which is more easily transferable than a retirement account. A division of the retirement account into two accounts is more common, but once again, there are multiple variables. For 401(k)s, this division must include a state court-ordered Domestic Relations Order which need to be qualified by the the plan’s Plan Administrator before releasing funds thus the term Qualified Domestic Relation’s Order(QDRO).This document instructs the retirement account administrator how to divide an individual’s retirement account. The court order must be very clear about how the account will be split , how much money will be transferred, and to whom the assets are to be awarded. Although obviously in a divorce situation it would be the ex-spouse, a QDRO may award to a different party, such as a child or a parent. A QDRO gives direction for the funds in a retirement account to be separated and possibly withdrawn. If they are withdrawn, the distribution will not be penalized. If the recipient is the ex-spouse they may also redeposit the funds awarded into their retirement account, which could be his or her own 401(k) or IRA. Direct rollover, or indirect rollover, to a recipient’s 401(k) or IRA– In a direct rollover, the non-participant spouse never actually receives the funds. Instead, the funds are rolled over directly from one plan to another. In an indirect rollover, the 401(k) administrator will cut a check to the recipient and the recipient will be responsible for placing the funds in another plan within 60 days. In an indirect rollover, the initial transaction is a distribution, which means the recipient will immediately be subject to a 20 percent withholding tax on the funds distributed according to tax law. And if the recipient does not add that 20 percent back when the funds are rolled over to another plan, the amount not rolled back will be subject to income tax. Lump sum distribution prior to rollover– Internal Revenue Code § 72(t) permits an alternate payee to take a cash distribution from the allocated 401(k) funds prior to rolling the funds over to an IRA. The recipient won't be subject to the 10 percent penalty for taking the cash distribution, but will be taxed on the amount received. A 20 percent federal withholding will be deducted before the distribution is made. The rest may be rolled over into another plan. To avoid taxation on the 20 percent withholding, the payee may make up the portion withheld out of pocket. The amount withheld may possibly be returned to the payee as a tax refund when he or she files a return. Cash out – If the recipient is 59 ½ years or older, he or she may cash out the funds. Regardless of the age, the funds will always be subject to income tax. There is no 10 percent penalty for taking the funds before the age of 59 ½, since this distribution is due to divorce. Direct transfer– The spouse awarded the portion of an ex-spouse’s IRA will request the financial institution to transfer the funds to his or her name via a Domestic Relations Order. This is typically done at a financial institution using a transfer to the recipient’s new IRA account. The term for this is Transfer Incident to Divorce. Renaming method– The IRA owner transfers the assets he or she is entitled to keep to a new account in his or her name, and leaves the original account for the recipient, changing the name on the original IRA to that of the recipient. If all of the assets in the retirement account are to be transferred to the recipient, all that needs to occur is changing the name on the account with the IRA trustee or custodian. This will rarely happen since the IRA trustee or custodian would want to retain all audit trails of each account. 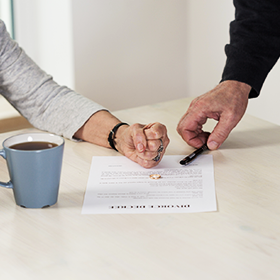 It is important to consult with attorneys and tax professionals before making any decisions on the division of retirement accounts in the case of divorce. Entrust does not endorse any one division choice for our clients.